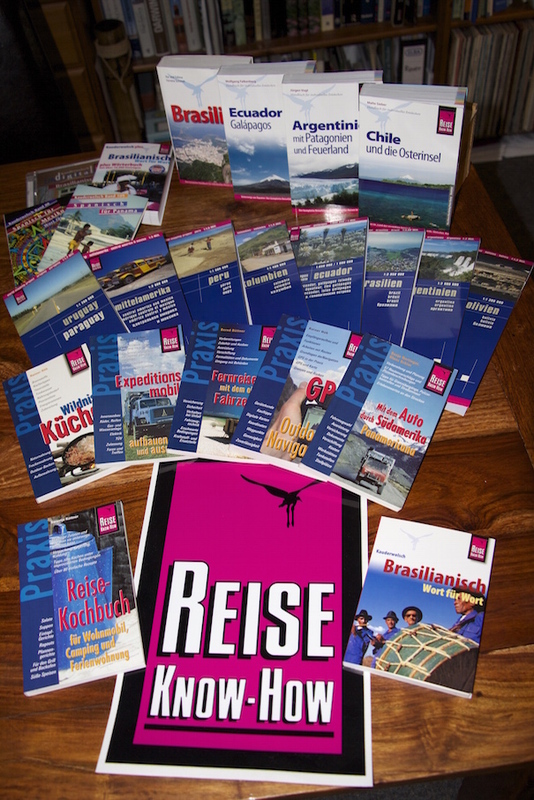 Peter Rump Verlag, member of "Reise Know-How" group, is our new sponsor, supporting us with guidebooks, maps, language guides and other helpful material ... The beginning of a new-cooperation! Thanks, Reise Know-How! This entry was posted in General Info and tagged Sponsors on 13. November 2014 by Juliane und Mischa. 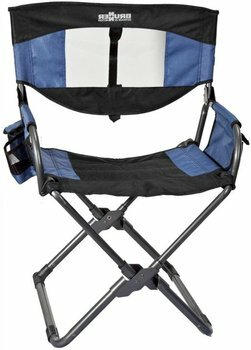 Maybe, it's just our personal problem, but finding the perfect travel chair seems to be way more difficult that deciding on any other piece of gear ... it's like an Odyssey! Well, that's what we thought when we were newbies to the subject! 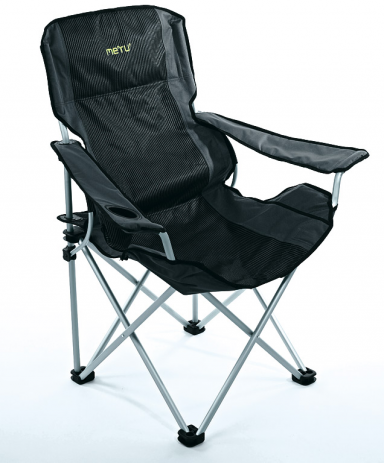 The first travel chair we bought was the "Meru Bastille", made for the German outdoor supplier "Globetrotter". 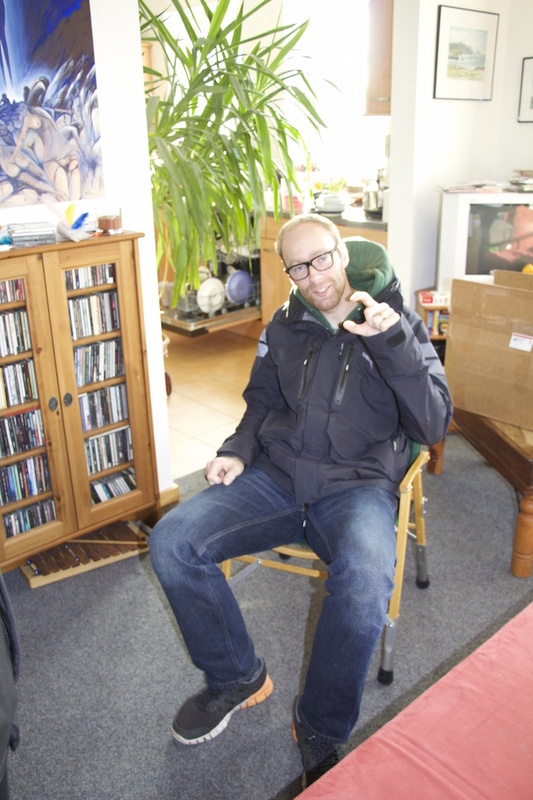 The chair was quite comfy but had a relatively large pack size of about 110cm x 22cm. The weight was relatively low with only 3100g due to the framework being made of aluminium. It had a high back rest and a cup holder. The chair was supposed to be suitable for persons weighing up to 120kg. ... After two trips (i.e. 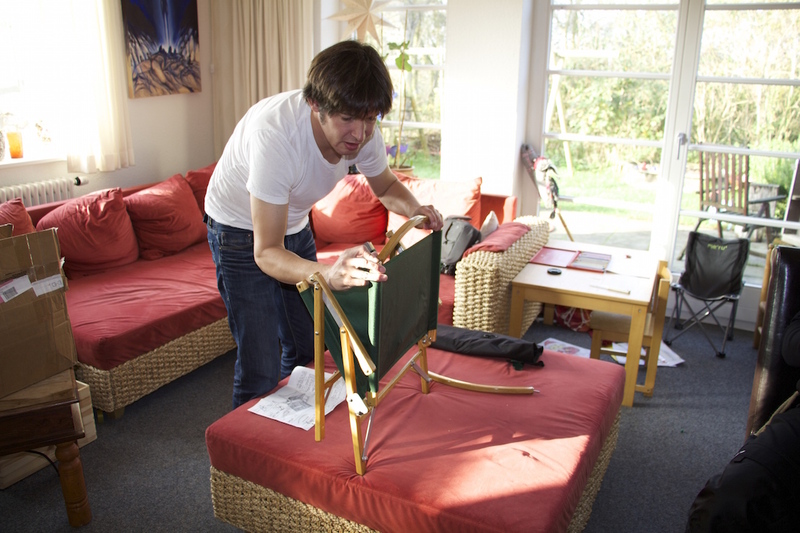 not more than 8 weeks of use alltogether), the fabric of one of the two chairs tore right at the connection between the seat and the frame. As all the four of us do NOT weigh 120kg (well, all together, we do, maybe! 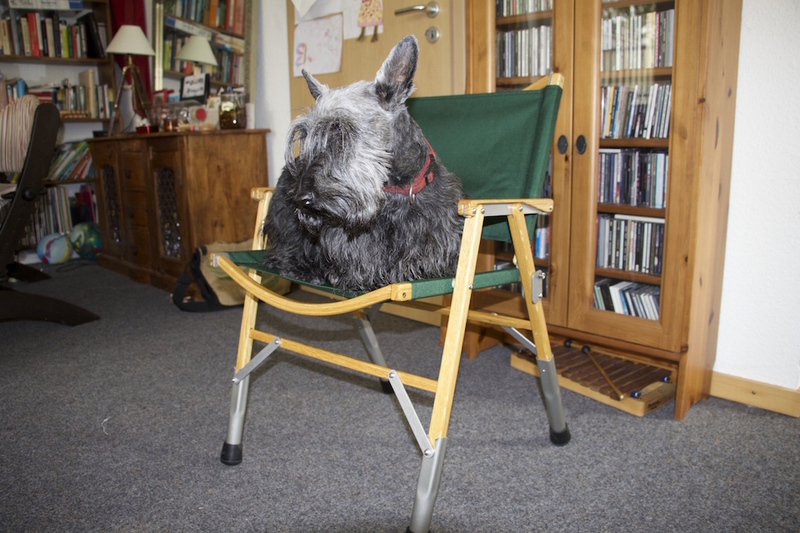 ), we had no real answer to that and decided that the "Bastille" was not the right chair for us! Being really obliging, "Globetrotter" gave us the money back for both chairs ... they don't produce them anymore! At the time when the "Bastille" broke down, we were travelling in the Pyrenees with our Swiss friends. Watching them setting up camp in an amazing speed, we were impressed by the camp chairs they owned which had a really small pack size and were set up within seconds to relatively comfortable chairs. The "Brunner Pico Lounger" really looked like a great travel chair. 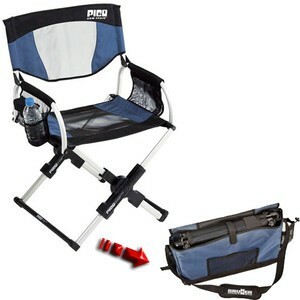 Its "Xpress Telescoping Technology" enables the user to fold the chair down to a 15th of its folded-out size. The pack size then is 44,5cm x 42cm x 6,5cm. The fabric is extremely durable and carries persons weighing up to 112kg. It weighs 4100g. So, after getting home and changing the Meru Bastille back into Euros, we travelled the internet to find a dealer who would sell us our own "Picos" ... only to discover that Brunner had just recently come up with a newer version of the Pico Lounger, named "Brunner Pico Sport", which has more or less the same packsize and weight, but is said to have a revised telescopic system. Now, we thought that this new version of the "Pico Sport" would be THE travel chair for us ... Its telescopic system helps to reduce the packsize of the chair to a 16th (!) of its set-up-size. The pack size is 31cm x 50cm x 9cm and it weighs 4000g. When the "Pico Sport" broke down, we remembered Coen Wubbels' words from this years Overland Reunion, stating that, actually, the most important characteristic of "THE" travel chair is that you have to be able to repair it almost anywhere with the help of basic mechanics using material you can get everywhere, because even the most refined, small travel chair on the market is worth nothing when it breaks down and you are in the Belizean jungle without an outdoor retailer around the next corner. 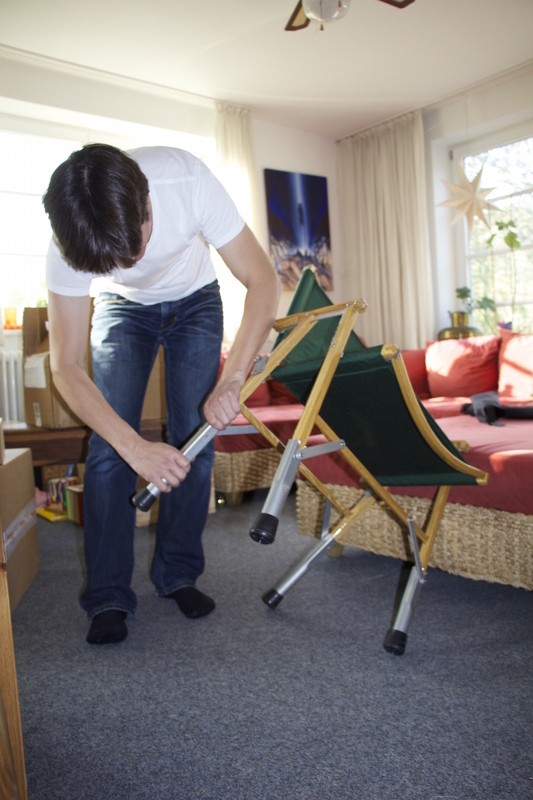 The more telescopic plastic or cast-metal elements you have on a travel chair, the less chance you have that you will be able to sufficiently repair it yourself or with the help of the village mechanics. (Yes, yes, I know you were right, Coen!) Without such a chair, you might end up sitting on the ground while the ants are not only going to do away with your breakfast! Not nice! 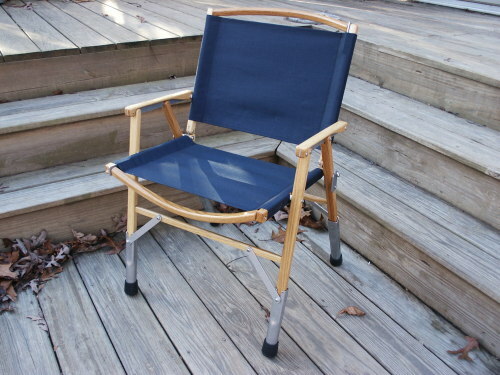 This, actually, reduces the material used for such a travel chair to plated metal, wood and fabric. And so continued the the quest for the "holy grail" of travel chairs! ... Now, that really was difficult! 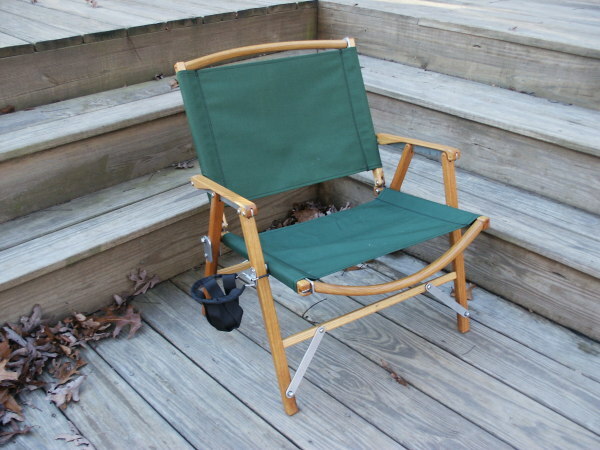 Where do you find a wooden travel chair which has a small pack size, is comfortable and where all parts can be removed separately and thus could easily be repaired or even remade by any carpenter, blacksmith or metal worker ...? But, yes, we found it - with the help of fellow nomad Coen Wubbels, who had seen a chair of that kind somewhere and gave us a name to google on the internet: "Kermit Chair". The "Kermit Chair", handmade in Tennessee, seems to have been an "insiders' tipp" in the motorcycle community for quite a while now, but to us it was completely new ... Nearly all the reviews we found on the net were positive! 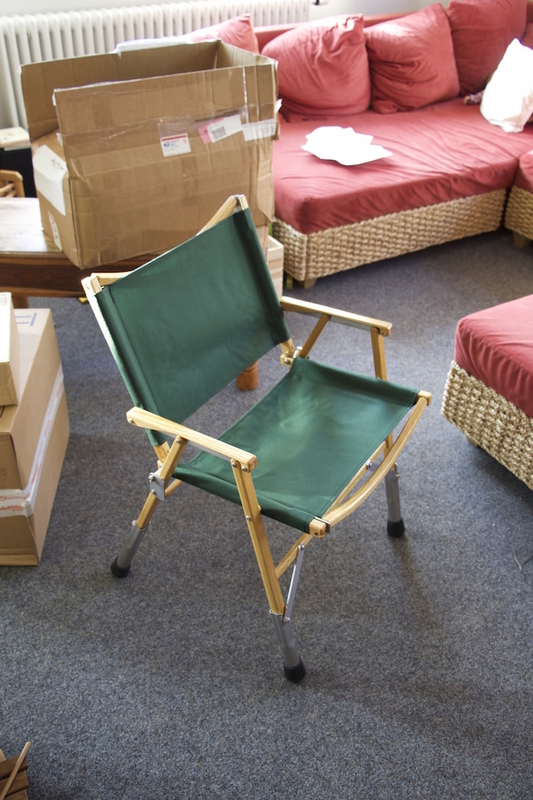 The "Kermit Chair", according to the company's website "is a light weight chair with the comfort and beauty not found in other portable chairs". Just take a look at the photos and you'll have to admit that the advert is not overdoing anything! It is made from hardwood , aluminium and Nylon-fabric, has a pack size of 55cm x 10cm x 15cm and weighs only 2400g. It can be set up in not more than one minute and can carry persons weighing 150kg (!). To increase the sitting-height, we also ordered leg extensions. 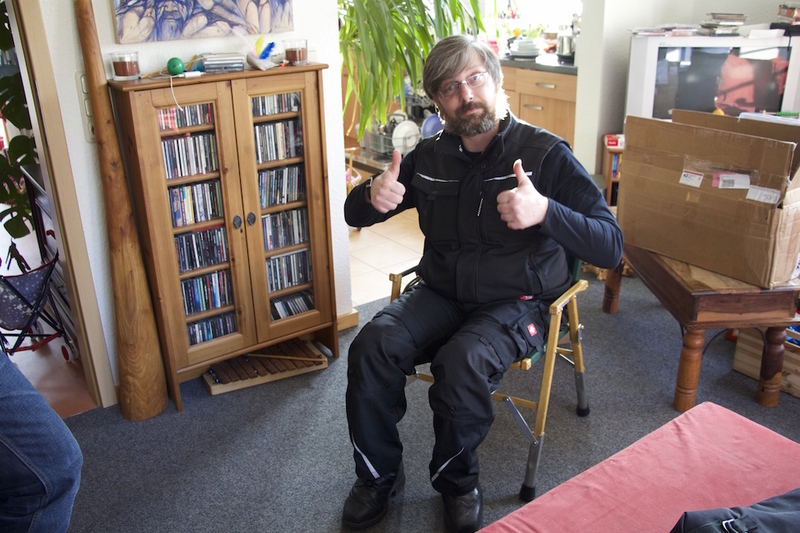 Now, the next problem was to find out where in Germany one could buy the Kermit Chair - absolutely no chance! None of the outdoor retailers in Germany sold it or was able to get it ... Well, so we had to buy them in the US and had them shipped to us ... What we got will hopefully last a lifetime - and: any broken part of it can be replaced anywhere on this planet. 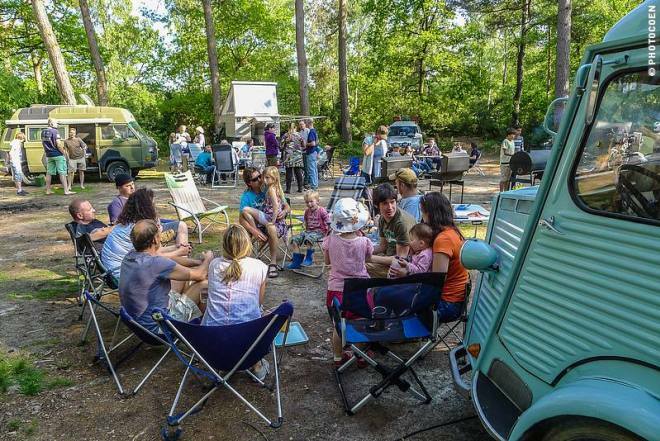 And: the Kermit Chair is really comfortable and the "old school" look fit's the Land Rover perfectly well, doesn't it?! 1st time - 1 minute! 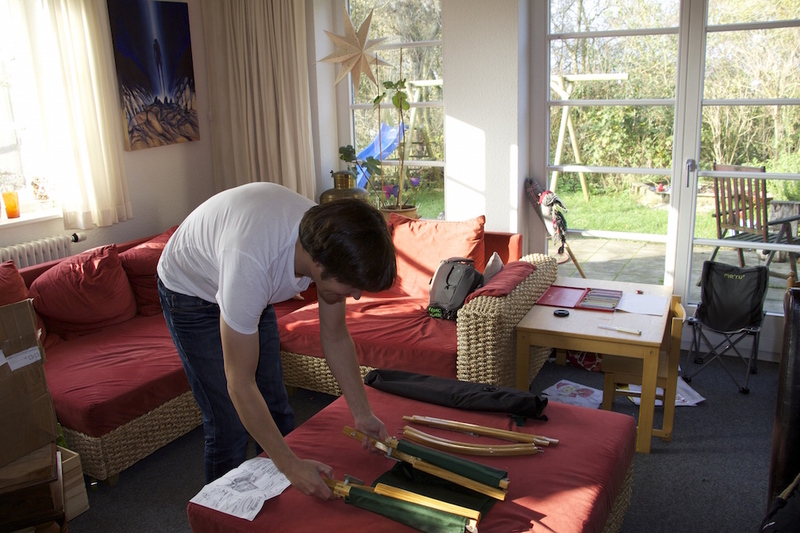 Setting up the "Kermit Chair" is really easy: install the two leg braces, then attach the curved braces, unfold the chair and then add the leg extensions. Done that! I had imagined that process taking way longer - it took me just less than a minute! And that was the first time! The design really is wonderful. The chair looks beautifully delicate and still seems robust and it has some kind of "British country style" to it. Most people who were around immediately found the chair really comfortable, especially it being a travel chair. The "Kermit" is even something for people with back problems as our expert stated! 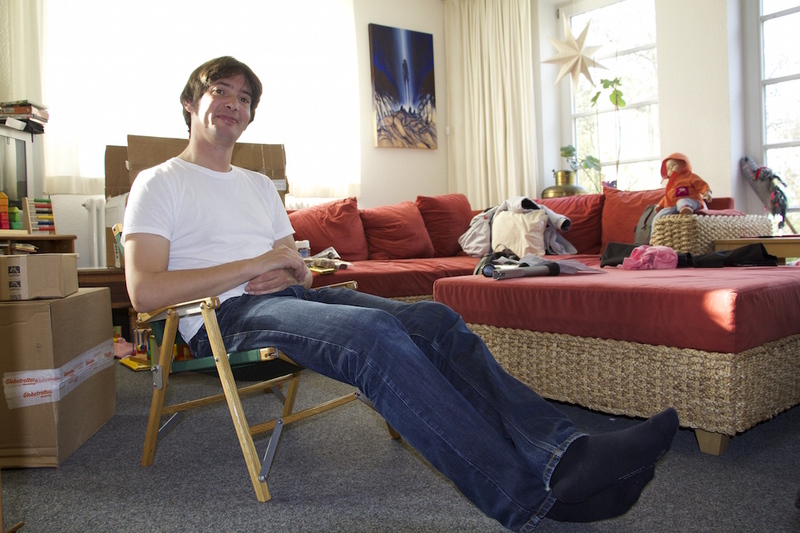 The leg extensions make the chair really variable, as you can decide between the "hang loose position" and a more upright one. For people with long legs (not true for the four of us! ), the "Kermit" with leg extensions might still be a bit short! We'll keep you updated with the "field-tests". Back expert says, "Thumbs up"! Too short for "Big Ben"
"British country style" - even Scotty loves it! This entry was posted in Gear and tagged Gear on 3. November 2014 by Juliane und Mischa.